Last night, it was a pleasure and privilege for BGS to stage our fourth Hall of Fame gala dinner alongside a celebration of the Old Brighton Grammarian Society’s 110th year. Thirteen Old Boys were inducted into the Hall of Fame and five Young Achievers recognised. Of the thirteen Hall of Famers, ten were present to collect their award and speak briefly on their life and the role that BGS played in shaping the person they are today. Despite the inductees finding success in extremely diverse areas, all spoke independently on a number of common themes. Many mentioned a particular BGS teacher who had had a profound impact on them. They mentioned giving everything a go and doing it to the best of their ability. They mentioned being a life-long learner, and being consistently inquisitive and curious. They also spoke about the ‘speed bumps’ that life tends to place along our road and their value in building resilience. Perhaps the best piece of advice for the night was to ‘sing the School Chorus once a day’! Crucially, I look forward to our current students continuing to see our Hall of Famers and Young Achievers as sources of inspiration and motivation. The new honour boards will soon go up in the Hall of Fame Gallery at the St Andrew’s end of the Secondary School. The night really was a superb gathering for our community and I thank the BGS team who brought it to life: Kate Birrell (Alumni and Community Manager), Hayley Galloway (Advancement Manager), John Phillips (Director of Advancement) and the MC for the evening, Deputy Headmaster and Head of the Crowther Centre, Dr Ray Swann. A particular mention also goes to Old Boy Tom Noske, who produced exceptional video stories of each Hall of Famer and Young Achiever. You can hear from some of the inductees here. We were fortunate enough to have Samuel Johnson speak to Secondary School in Chapel this week. As you will read in Simone Mills’ article, it was an emotional Chapel with a very strong message about the devastating effect of cancer on families. Samuel challenged the boys and staff to go home and have a difficult conversation with their parents; I trust that your son did this. As we approach the weeks leading into exams, I would like to revisit the importance of routines for your boys. Dr Ray Swann (Crowther), Megan de Beyer (Mother/Son Afternoon Tea) and Dr Arne Rubenstein (Rites of Passage program) have all reminded us recently of the benefits of routines. 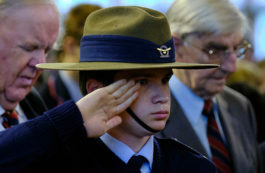 Revision techniques and structured learning activities are taught explicitly to all Years 7 and 8 boys during these two weeks. The key is to combine these with healthy sleeping patterns, healthy low-GI food, good hydration and exercise. Please encourage your sons to see their pastoral team for extra support if needed. Our House Tutors, Heads of Houses and School Psychologists are a wealth of knowledge and advice during the exam period. Students are taught how to create accurate and comprehensive notes to promote their understanding of the exam content. More importantly, they learn that they need to review these notes regularly to embed them in long-term memory. Please note that Monday 26 November is a Report Writing Day and students are not required to attend school. Their exams will be returned on Tuesday 27 November, followed by a Coaching Day on Wednesday 28 to establish goals for 2019. Promotions classes for 2019 will run from Thursday 29 November for the rest of term. This program allows boys to commit to the expectations (and routines) for the 2019 academic program. At the end of term, they should have the composure to enjoy their summer break and begin a new year with confidence and certainty. Last week, 45 Year 8 boys and their mothers took part in the annual Mother/Son High Tea. Facilitated by psychologist and relationship therapist Megan de Beyer, the event explored the mother–son relationship, and the opportunities and challenges that arise during the teenage years. The afternoon began with an activity on the Crowther Oval where mothers listened in to conversations from the Year 8 boys about how life has changed for them as they move away from junior years and closer to the senior years of schooling. Moving up to the Annandale function room, the boys and mums enjoyed some delicious treats. Megan guided them through some simple yet impactful dialogue. This gave the mothers and sons precious dedicated time to talk and connect on a level that is hard to attain during the pace of everyday life. A big thank you to the BGS Year 7 Parent Group, who helped with the setup and serving of food, and of course to Megan for facilitating the insightful activities. We have had four successful Ute Full of Food drives this year, raising over $12,000 worth of non-perishable food for St Mark’s. We donated an estimate of $5400 worth of food in our latest drive alone, a great achievement. St Mark’s provides at least 80 people with food each day and with Christmas coming up, the goods need to last through to Term 1. We wish the team at St Mark’s and their clients all the best for this time. This year at the Urwin Centre, Crowther House was the highest donor to Ute Full of Food on all four occasions. Rofe and School should also be proud of their efforts, consistently donating a substantial amount. A big thank you to the Crowther House tutors, Ms Mewett and Mr Nixon, for their encouragement. Special thanks to the Paino brothers, who arrived with four bags each to pull Crowther across the line, much to the disappointment of Rofe, who thought they had it in the bag. We would like to thank everyone involved in Ute Full of Food this year, especially Ms Lewis and Mr Weymouth for their organisation. Good luck to everyone next year! Last Friday afternoon, a selection of our young pianists and an appreciative audience welcomed the weekend with a delightful Piano Soiree. 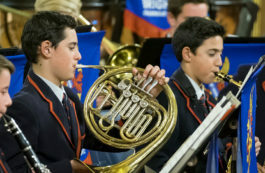 Approximately 20 boys from Years 3 to 10 presented works by Bach, Mozart, Beethoven and many more. There were also a number of boys performing in small groups, including a trio of young pianists jostling for space on the stool as they performed an impressive six-hand arrangement of the William Tell Overture! Thank you to our piano tutors, Isaac Mouskovias and Nina Xu, for their fantastic work with these young musicians. Last Wednesday, the Year 10 Music Performance class brushed off the relaxation of the four-day weekend and thrilled the audience at their Semester 2 Solo Recital. As well as forming a significant portion of their assessment, this performance was the culmination of their academic music studies for the year. All of the boys presented their performances in fine form, demonstrating their diligent efforts and commitment. Congratulations to these fine young musicians, and thank you to their teacher, Frances Walker, and our School accompanist, Isaac Mouskovias, for their work with the boys both in the recital and throughout the semester. Good diet and nutrition is crucial to your child’s development. Not only can it prevent many chronic diseases, but it also affects brain development, learning abilities and mental health. School TV provides interviews with leading specialists, helpful articles and fact sheets on the subject. Box (or cycle or HIIT or downward-dog) your way into shape at your community gym in Annandale. Discounted Foundation Memberships are not available for much longer – don’t miss out. You’ll love the small class sizes, qualified trainers who can tailor the class to your needs, superb setting and high-quality equipment. Visit the Annandale Gym website.